Trudging through old logged over forest in Coupe 4, my assistant and I walked along Malat River and arrived at a natural mineral lick, situated about five metres from the riverbank. This natural mineral lick, which we conveniently called ‘salt lick’ was filled with tracks of animals. Judging from the fresh signs after rain the previous night, bearded pigs were already here early in the morning before we arrived. Signs included footprints on the soft soil, easily identifiable from the deep imprints of the hooves and metacarpals, and burrows of the earth, destructively left behind after their feeding activity. These are signs indicating that wildlife species such as bearded pig do visit salt licks in the forest. As part of my study, I set up automatic trigger cameras here, equipped with infra-red motion sensor that automatically triggers the digital camera to capture images or videos, which are then stored inside the memory cards. The cameras were left to ‘work’ for 30-40 days since they were last switched on, capturing images and videos of animal passing in front of the point-of-view, an area within the range of the infra-red sensor. On my subsequent visits, the memory cards were replaced and the cameras were reset, only to be revisited 30-40 days later. Back at the base camp at Sekawie, after the data from the memory cars were uploaded, I could finally confirm the presence of bearded pig. One of the images showed a bearded pig at the salt lick that morning! 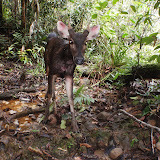 Since August 2010, camera trapping exercises have been carried out, not at one but three salt lick sites in Anap Muput Forest Management Unit (AMFMU). One of the major queries I received was why I conduct study on wildlife and salt licks? Also, I received endless queries on why I have decided to engage with logging companies? After all, many would have thought that these two components seem an unlikely match. If this is the case and since I have chosen to conduct my research in a logging concession and forest plantation areas, I have an important role as a ‘matchmaker’ to help bring conservation and logging into ‘marriage’. In AMFMU, the company involved may already have conservation activities in place, as prescribed for in the forest management plan. Nevertheless, it is envisaged that this study can assist in improving their knowledge base, so proper management measures can be shared and implemented. 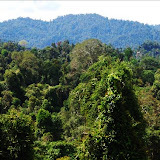 After all, only about 11% of the 4.39 million hectares of Permanent Forest Estates (http://www.forestry.sarawak.gov.my/forweb/sfm/pfe.htm) in Sarawak are classified as Totally Protected Areas, leaving the remaining bulk of 89% in Communal Reserves and Forest Reserves, of which the latter dominates. Forest Reserves are areas set aside for timber production. Therefore, the roles of timber concession forests which lie within these Forest Reserves are equally crucial towards wildlife conservation, because they occupy large tracts of forests left in Sarawak. 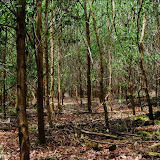 In many cases, substantial population of wildlife occur inside these forests. Hence, we need to put considerable attention to these forests also if long-term wildlife conservation is to remain significant. Within a timber concession area, wildlife uses various types of habitat to survive. Among these important features is the salt lick, a naturally mineral deposited area where animals visit periodically for mineral uptake. 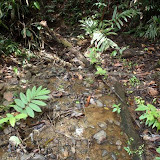 Plants in tropical forests have very poor mineral contents. Herbivores notably, depend on other sources for their nutrient uptake, of which salt lick is one of them. Despite the importance of salt licks to wildlife, as already documented in a study in Sabah (Matsubayashi et al., 2007), there is no study ever conducted in Sarawak. Timber company managers do not have any information on the scale of use of salt licks by wildlife inside their concession areas. One of the criteria of sustainable forest management is the need to conserve important habitat for wildlife, and salt lick is considered one of them. However, there is no data to assist timber managers in their forest harvesting plan and there is no clear guideline on how wide an area surrounding a salt lick must be protected from any logging activities, including building of skid trails. The distribution of some mammal species appear to be determined by the distribution of natural salt licks (Stark, 1986; Payne and Andau 1991; Chanard et al., 1998; Laidlaw et al., 2000; Matsubayashi et al., 2007); and to some extend affecting movements and home ranges (Pages et al., 2005). In other studies, use of salt licks have been shown to supplement poor diet uptake by wildlife (Holdo et al., 2000; Matsubayashi et al., 2007); as supplementary dietary needs and to alleviate ailments (Mahaney et al., 1993; Mahaney et al., 1995a; Klaus et al., 1998; Diamond et al., 1999; Krishnamani & Mahaney, 2000); to absorb toxins and alkaloids from plant materials (Mahaney et al., 1995b; de Souza et al., 2002; Symes et al., 2006); or to alter food properties for easier digestions (Mahaney et al., 1995a; Diamond et al., 1999). Many of these studies were carried out elsewhere, and information from Borneo remains very limited. 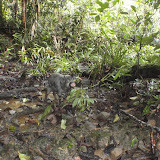 A study in Deramakot Forest Reserves in Sabah indicated that more than 78% of known species that occurs in the reserve were recorded to have visited salt licks for their nutrients uptake, especially herbivores and frugivores which require sodium from naturally available resources such as salt licks, but are lacking in plants (Matsubayashi et al. 2007). Zedtee co ltd. (Zedtee) started operation in AMFMU in 1989, from Coupe 6 onwards. It took over operation from Dunia Forest, another timber company. There are 25 coupes inside AMFMU, with one coupe harvested per year over a 25-year harvesting cycle. Seco nd cycle harvesting started in year 2000, from Coupe 1 onwards again. In the early phase from 1989, conventional logging method was used. In 1993, path logging method was engaged under the Model Forest Management Area initiative by ITTO, starting from the present Coupe 15. Reduced Impact Logging (RIL) method was introduced in 2007 when Zedtee underwent Sustainable Forest Management (SFM) certification exercise. In 2009, Zedtee obtained the License for Planted Forest (LPF) which set for transformation of Coupes 1-4 into planted areas for native trees, acacia, albizzia and oil palm. These coupes have been renamed as Blocks A – G¹ . AMFMU covers an area of over 83,500 hectares, made up primarily of dipterocarp species at elevation of less than 400 metres, hereby classified as lowland mixed hill dipterocarp forests. Three sites within different management regimes and also containing salt licks were selected for this study. They were Malat in Coupe 4 (logged in 2003), Sebedi in Coupe 1 (logged in 2005) and Coupe_11 (logged in 2010). Automatic trigger cameras also known as camera traps (Bushnell Trophy Cam; Marif FieldNote) were placed at salt licks, and thereafter at 200 metres intervals up to a distance of 2000 metres. All three salt licks in Sebedi, Malat and Coupe_11 lie beside a stream. Distance from the edge of stream is taken as control for all camera trapping points. From August 2010 to January 2011, the total survey effort was 4,441 camera-trap-days. A total of 27 species of large ground dwelling birds and terrestrial mammals were positively identified. 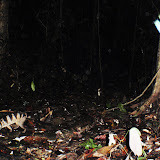 Some species were difficult to identify from camera trap images or videos, such as mousedeer (Tragalus kanchil and T. napu) and muntjacs (Muntiacus antherodes and M. muntjak). Muntjacs, sambar (Rusa unicolor), bearded pig (Sus barbatus) and pig-tailed macaque (Macaca nemestrina) were the most recorded species in AMFMU. The number of species recorded from Malat is highest of the three zones, with 22 species. It also contains a high number of carnivores (i.e. 7 species), similar with Sebedi. Of the three zones, Coupe_11, a recently logged site, records the lowest number of species. There were some levels of hunting activities recorded in all three zones, and hunting dogs were present in Malat and Sebedi as they were captured by the camera traps. In Malat, up to five dogs were recorded at one time in one of the trapping points. The close proximity of human settlements and the presence of good road networks in Malat and Sebedi mean the salt licks here are more accessible to local people, who hunt with dogs. The encounter rates for large ungulates such as sambar, bearded pig and muntjacs were low in Malat and Sebedi as compared to Coupe_11. The salt lick in Coupe_11 is less accessible to people, although signs of hunting were present but on lesser intensity. According to the laws, hunting by outsiders and camp workers is prohibited. Zedtee has set up security gates to prevent any illegal activities from occurring. Only the local communities living inside AMFMU are permitted to hunt for their personal consumption. 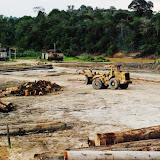 The different management regimes of AMFMU in relations to time since last logging activities have shown notable effects on wildlife communities. In zones where logging was carried out more than five years before (in between 2003 and 2005), species diversity was higher as compared to recently logged zones (logged in 2010). Eight carnivores, species on top of the food chain, were recorded in Sebedi and Malat, as compared to only five in Coupe_11. Other significant findings included Sunda clouded leopard (Neofelis diardii) and leopard cat (Prionailurus bengalensis) which were recorded from Sebedi, and bay cat (Pardofelis badia) and marbled cat (Pardofelis marmorata) in Malat, both old logged over forests. In terms of globally significant species, AMFMU supports at least two species classified as endangered i.e. pangolin (Manis javanica) and bay cat, and another eight species (pig tailed macaque, sunbear (Helarctos malayanus), binturong (Artictis binturong), banded palm civet (Hemigalus derbyanus), sunda clouded leopard, marbled cat, bearded pig and Bulwer’s pheasant (Lophura bulweri) classified as vulnerable according to the IUCN redlist of threatened species (IUCN 2010). The presence of globally significant species inside AMFMU indicates that logging concession area where sustainable forest management is in place, may be able to support and sustain populations of wildlife. AMFMU formed part of the ITTO Model Forest Management Area that was implemented in Sarawak from 1993-2006, had undergone timber certification exercise in 2004, and successfully obtained certification in 2007. Local awareness is key towards conservation of wildlife, through promotion of reduced and sustainable hunting methods. However, long-term monitoring is essential and must be put in place to gauge the effectiveness of these measures in relations to the status of wildlife. If left uncheck, over hunting by the local people, either for personal consumption or illegal trade, will eventually defeat the purpose of widlife conservation initiatives in sustainable forest management sites. The study in AMFMU enters its second phase in 2011. The species list generated to date is inconclusive as the data were collected at the onset of wetter months. Rainfalls were higher in the months of October to January/February. Survey effort will be increased as more surveys are planned to incorporate the drier months, so that a one-year analysis can be carried out. Since May 2011, more camera trapping activities were carried out. 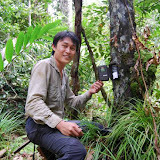 In addition to the salt lick sites, camera traps were also set-up in eight other sites all over AMFMU (this component of study is jointly undertaken by Hiromitsu Samejima). Social surveys to determine hunting patterns and diet of local people is planned towards second half of 2011. Nutrient analyses of water samples from salt lick sites will also be carried out. 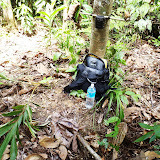 In May 2011, the survey has been extended to an adjacent production forest, an acacia plantation managed by the Sarawak Planted Forest (SPF) project. Here, camera traps were set up at a salt lick site. In the future, more sites at SPF will be surveyed so that comparison can be made between a logging concession and a planted forest. This study is also supported by the Kyoto University Graduate School of Global Environmental Studies (Laboratory of Landscape Ecology and Planning) and Environmental Management Leadership Programme. ¹Block A-G: Block F is situated in Coupe 25, and forms part of the LPF areas. This entry was posted in 未分類 @en and tagged Anap-Muput. Bookmark the permalink.